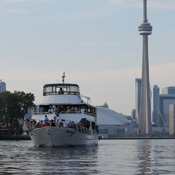 Treat your staff or your clients to a professional and relaxing cruise around the Toronto Islands and waterfront. There is no finer reward for a job well done than sipping a cold drink and watching North America's most vibrant city slip by as the sun goes down. Tell us what you want and we will make it happen for you and your guests. Whatever the occasion, birthday, anniversary, shower, stag and doe we will make your event a day to remember. Our professional, mature and uniformed crew have been sailing the waters of Toronto Harbour for over thirty years and promise to make your event everything that you want it to be. The biggest day of your life deserves nothing less than to be celebrated on board 'Toronto's Signature Yacht' the Miss Toronto. Let us make the day hassle free and super guest friendly. Your guests will remember your wedding for the rest of their lives. A special day aboard a special private yacht. You tell us your idea and we will put it out to out designers. Nothing is to big or too small. Chances are we have done it before and we can give you lots of help in deciding what will make your event stand out like none other. Catered by some of Toronto's finest chefs our dinner cruises are famous for the freshest meat and veggies in the harbour. Everything is bbqd right onboard the yacht. We will also do special ethnic menus on request. Sometimes ideas just don't fit into any category. As owner/operators we pride ourselves in be able to adjust our entire business to suit any requirements that you may have. When it is too much for the others we will gladly put something together for you. Fast and professional.